Our charming cottage is set amongst other cottages in the forest alongside the Koksilah River. The surroundings are beautiful and serene. The cottage sleeps six and on the main floor offers a bedroom (queen), bathroom (heated floor, refurbished 80 year old claw foot tub and shower. Kitchen (gas range, full size fridge), dining and living area (wood burning stove). The upstairs loft is open and airy with views of the forest and the river. It features 2 queen sized beds and a family area. At the back of the cottage, through French doors off of the kitchen and dining area there are two decks overlooking the forest and the river. There you will find a Weber barbeque and outdoor furniture that you can enjoy as you sit back and take in the view, the soothing sounds of the river, and quite simply… nature. 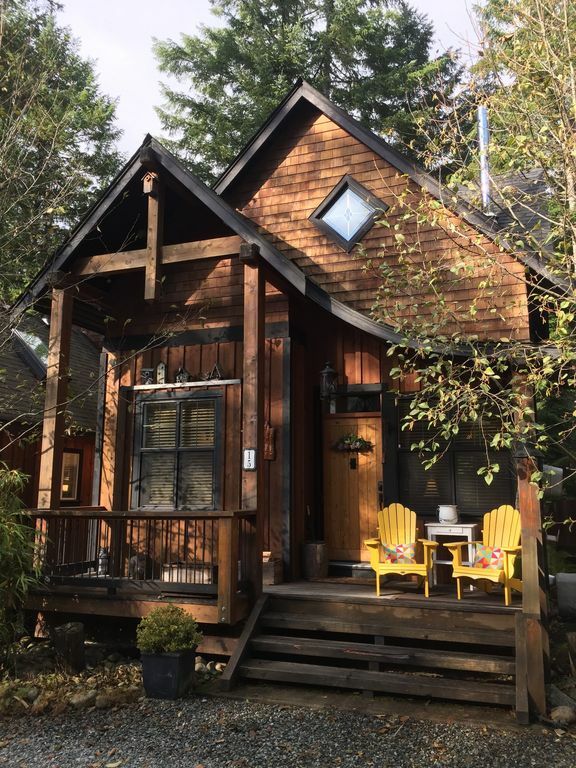 The cottage is a retreat to return to after a day of antiquing, enjoying the water hole at the river, swimming in nearby Shawnigan Lake or touring wineries, local markets… perhaps a lavender farm. The Kinsol Trestle is about a 20 minute walk and if you prefer a longer hike, you can continue on for miles in the woods along well-groomed paths. · Cobble Hill, approximately 15 minutes away, offers groceries and amazing fresh roasted coffee. - Cowichan Bay, approximately 20 minutes away, is on the ocean and offers restaurants, bakeries, shops… even ocean kayaking. · Duncan is approximately a 30 minute drive north. On Saturdays in the spring, summer and fall, there is an amazing farmers market. · Victoria is approximately a 40 minute drive south. This beautiful river cottage is owned by Doug and Michelle, it is a peaceful place to be. Main floor bathroom with mini claw foot tub, with shower. Fully stocked kitchen with all utensils. Swimming holes and river are 2 minutes away. This cottage is perfect for a getaway holiday. We were on the Island to visit our granddaughter at Shawnigan School, and, the cottage was less than 10 minutes away. Unfortunately, we had rain every day so we didn’t get out exploring the surrounding property and local sights. But, the wood burning stove kept the cottage toasty warm and the furnishings were comfortable and inviting. The cottage has all the amenities I needed to bake, barbecue and cook. Linens were lovely and everything was immaculate. The owners have poured their love into every detail and we were lucky to have found this charming little piece of heaven. Note: There is no phone or tv reception, but the wifi worked well. Thanks you so much for the kind words. We are glad you enjoyed our place by the river. Sorry about the weather however it does make one enjoy the fireplace even more! We have a TV with an apple box available in the loft. Would stay at this cottage again! The sound of the river running is great! Thank you Joyce for the kind review. We are glad you got to experience our little river cottage. The house was full of character, beautifully furnished and set in a delightful location. We really enjoyed our stay, and looked forward to returning to the house every night after busy days sightseeing. The house is very cosy, with a great outdoor multi-level decking. The owners, Doug and Michelle are very responsive to questions and recommendations on the area and even their neighbour at the house was helpful with suggestions on good restaurants and places to visit. The location is superb, secluded and away from the bustle of city life, yet a reasonable drive away from Duncan and Victoria. We would definitely stay here again if we return to the island in the future. Thank you for the kind words about our cottage, we are glad you enjoyed the cottage and surrounding areas. We look forward to having you stay again with us in the future. Loved our stay here with family of four. Such a beautiful little spot with every little thing perfect! Thank you Shannon for the review, we are so glad you enjoyed your stay. The cabin is well maintained with lovely appointments...We enjoyed quiet evenings after wonderful sightseeing! Thank you for the great review. We are glad you had a great stay at our cottage.